Safeguarding critical data is becoming more and more challenging in this age of cloud computing. Wherever it resides - in databases, files, big data, cloud, and more - it is vulnerable to attack. You need a strategy for data security and governance to analyze risks, shield data from external and internal actors, and rapidly adapt to changes. 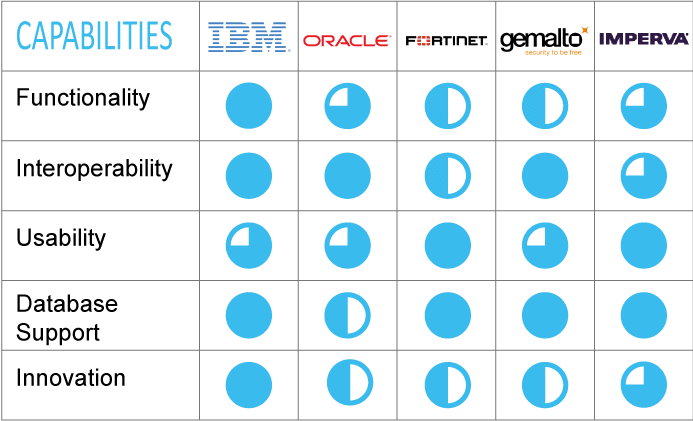 IBM has a "significant capability set" with its broad ecosystem of solutions, including BigFix and Trusteer Apex integrations. IBM Security Guardium provides a single data protection infrastructure for your entire environment. It helps ensure the security, privacy, and integrity of your critical data across a full range of environments, from databases, big data, files, cloud, and more. Guardium helps analyze, protect and adapt for comprehensive data protection. It protects sensitive data against threats with encryption, masking, redaction, activity monitoring, dynamic blocking, alerting and quarantines. The comprehensive data protection platform empowers security teams to automatically analyze what is happening across the data environment to help minimize risk, protect sensitive data from internal and external threats, and seamlessly adapt to changes that affect data security and compliance. Oracle Database Security suite of offerings can safeguard your most valuable data with Oracle’s powerful preventive and detective security controls. Oracle solutions cover database assessment, protection, monitoring and compliance. With Oracle, you can deploy reliable data-security solutions that require no changes to existing applications, saving time and money. Some of Oracle’s offerings are designed exclusively for Oracle databases. Fortinet’s database security software, FortiDB, is a comprehensive database security and compliance platform. The FortiDB family of appliances and software delivers a complete Database and Application security product line delivering centrally managed security, audit policy compliance and Vulnerability Management (VM) for databases and applications across your extended enterprise. Gemalto is a world leader in information security, providing software applications, secure personal devices such as smart cards and tokens, and managed services. Gemalto’s enterprise security solutions include identity and access management, data encryption, crypto management and cloud security. Imperva provides strong database protection and monitoring with advanced security analytics across multiple platforms and environments with minimal performance overhead. Imperva can extend database audit and protection to Amazon Web Services and Microsoft Azure using the same architecture that they offer to protect on-premise data. Imperva’s unified security policies allow consistent security across on-premises and cloud databases - enabling you to provide unified audit reports for all of your data when needed for regulatory compliance.